Enough of playing it safe with outfits! When it comes to trousers, we have overdone colors like black and blue, are getting bored of gray and white, and are slowly venturing into olive green. But, It’s time we take the plunge into the perky red that is dissed for no good reason. You can wear it anywhere – to work or to parties – just as long as you know how to style it. And how do you know that? By checking out our outfit ideas, of course. Take a look! Whether you have to attend a business meeting, a party, a casual luncheon, or a game, you can sport red pants anywhere. So here are some outfit ideas that you can around play with. If you are starting wearing red pants for the first time, pairing them with a black and white striped T-shirt is a good idea. It makes for a great office outfit. You can also switch out the T-shirt for a sleeveless turtleneck or a full-sleeved sweater. Finish off the look with red pumps. High-waisted trousers are having a moment right now. 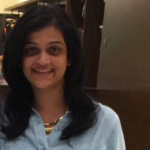 They create a great silhouette and up your chic quotient effortlessly. Team them with a light blue button-down shirt, tuck it in, and show ‘em how it’s done! Have dinner plans but not in the mood to put in any effort? Pull out those red leather pants, a white one-shoulder top, and red pumps. You are dinner-ready in less than 5 minutes! Don’t forget to put on some red lipstick though. Let out your inner nerd with a pair of ankle-length trousers and a printed shirt. Tie your hair in a slick bun and put on big glasses or shades and black pumps. You can throw on a sling bag for good measure, too. Feel free to play with patterns by subtly moving away from the usual. Pair your tapered red pants with a long striped shirt. Put on a wide black belt to cinch in your waist and take the outfit a notch higher. Ditch your regular fitted pants for some Bohemian vibes. 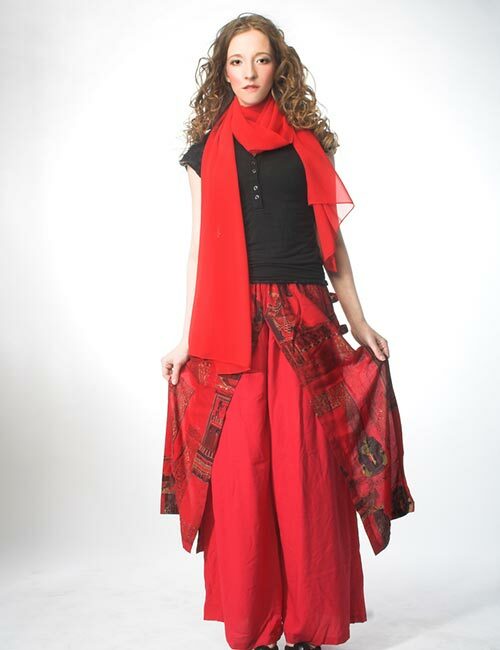 Pair red palazzos with a simple black top and a red stole to create this boho-chic lool. A floral pashmina or a silk scarf goes well with this vibe as well. Let go of the stereotypical formal outfits a little bit and try something new. Red ankle-length pants with a muted tan sweater look understated and suave. A pair of kitten hills and a cute little bun are a great way to finish off this outfit. Sport some high-street fashion without looking overtly jaunty. 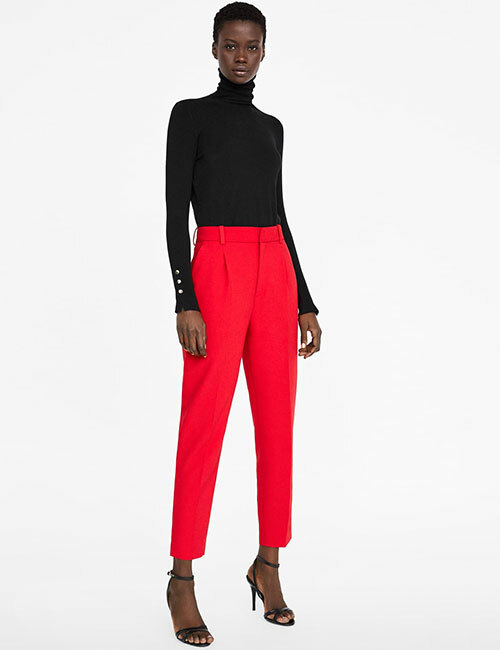 A black crew neck sweater or bodysuit with red cigarette pants and ankle strap heels is a great way to own this look. 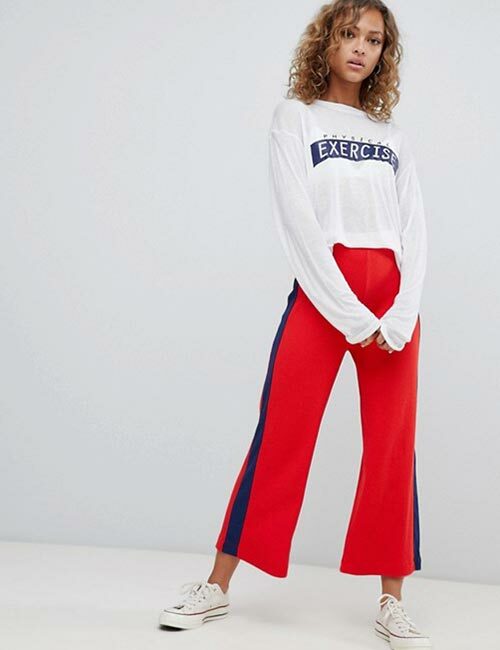 This matching trousers and crop top look is one that you absolutely need to try. It screams party but not in a way that’s too in your face or flashy. You need no accessories to pull off this look. Just a clutch and pumps will get the job done! I cannot get enough of plaid in my life. But instead of a skirt or a shirt, sport red plaid pants. You can style it with an oversized white shirt or a plain crop top and Converse. Talk about killer street style! Wide-legged trousers in a burgundy, wine, crimson, or brick red are an interesting choice if you want to tame the red a little bit. Pair them with slick chiffon pleated top or a silk blouse to create an elegant look. You can throw on a beige blazer or a leather jacket and carry a clutch if you are headed to a party. Mix structured silhouettes with flowing fabrics to strike a balance between the two. This white noodle-strapped silk top simmers down the red pants. You can choose to dress up or down with outfits like these. 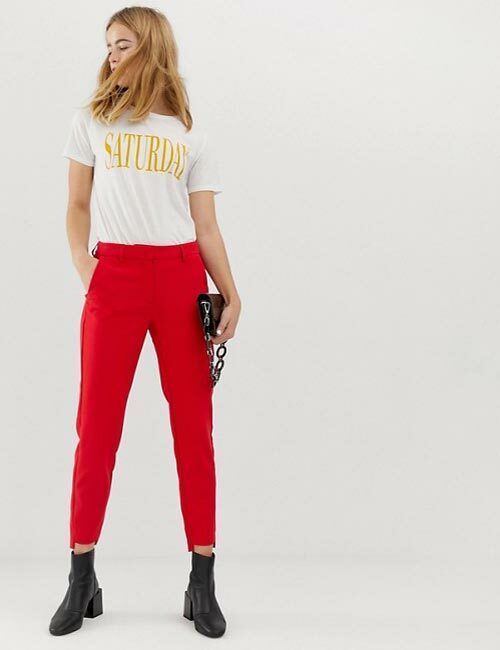 Embrace your inner tomboy with some red pants, a graphic T-shirt, ankle boots, and oversized shades. Finish off this look with a cross body bag! 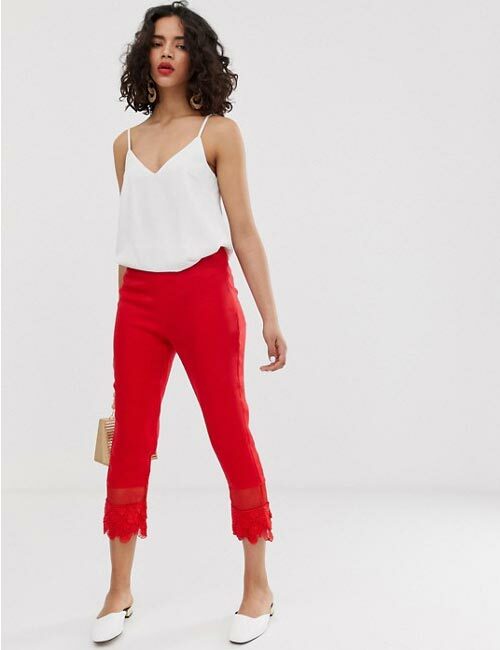 Get all heads turning when you walk into a room in these red embroidered pants and white top. 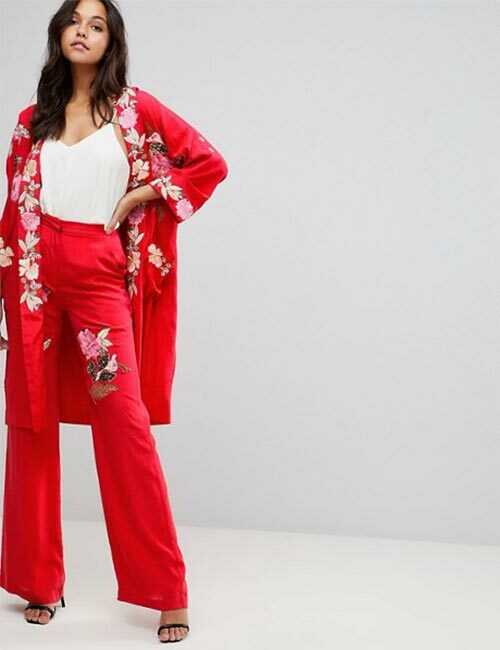 The cherry on top is the floral kimono. If you want to be a little adventurous and go all out, you can swap the florals for an animal print. Borrow both grunge and sporty vibes with these culottes, an oversized T-shirt or sweater, and Converse shoes. What’s great about this look is that it has a subtle vintage vibe. Red pants surprised you, didn’t they? 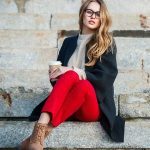 Do you shy away from the idea of red pants? If yes, now is a good time to invest in a pair. What are your thoughts? Let us know by dropping a message in the comments section below.